Escape Buenos Aires for the day to experience Argentine country life on a day trip to the ‘pampas,’ or farmlands. 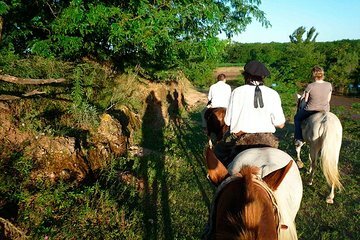 Visit the charming village of San Antonio de Areco and a traditional ‘estancia’ for horse rides, a folk show, and a classic Argentine barbecue. You’ll also get a chance to interact with the cowboys who preserve the country’s rich ranching heritage. This all-day tour is certainly worth the price. The horseback walk was fun, as was the music and dancing after lunch. The lunch itself was just OK, a little disappointing. But we didn't go for the food. As an aside, the rest stop on the way has a lovely gift shop, not junk souvenirs. I bought a little bracelet however, my AmEx card was hacked there, so beware. Unfortunately, it was only the 4th day of my trip and AmEx had to de-activate my card. Good thing I had a 2nd card.